Hi guys! I've got something really awesome to show you today! Maria from Hypnotic polish was so kind as to send me 8(!) sets of water decals from MILV, the new brand they carry! I had never used water decals before so I was really excited to try them out for the first time! I am showing you only one set today, because I want to do full manicures with them. These are too pretty to use quickly for testing only! Ready for a wall of text? MILV decals come in 2 different styles: in a big square sheet, all with the same print, that you can cut to the size you want yourself, or in 10 small rectangles with different sizes and prints, each corresponding to a specific nail. These rectangles however are still very big and not curved at the top, so you have to cut them to fit your nails. Also, there are both transparent and opaque images and they have more than 150 pattern to choose from! The set I am showing you today is number N250, a cute set of brightly colored flowers and vines with tiny creatures hidden between them. This set is transparent, so I applied a basecolour first. 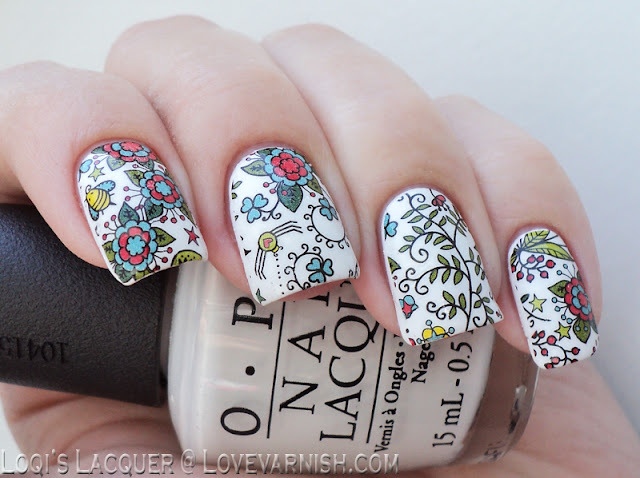 The decals all come on white paper backing and I really loved how the bright flowers looked against the white, so I thought I'd do the same thing on my nails and painted them with OPI Alpine Snow. If you use a basecolour, make sure it's completely dry before applying the decals. After cutting the decals into your desired shape you put them in a bowl of water for a few seconds and wait for the paper backing to come off. There is no plastic sheet you have to peel off first, these come in little plastic baggies to protect them instead. However, instead of putting them in water I found that it was much easier to put the decals on a soaked cotton pad, so I didn't have to go fishing for them in the bowl. After taking them from the water/cotton pad (I used tweezers to do this) you just place them on your nail, slide them in place and softly pat them down (your can use your finger for this, but I preferred doing this with a wet cotton pad). If you left them too long for your nails you then simply fold over the edge and gently file away the excess. Apply topcoat (don't forget to wrap your tips), and done! I was very impressed with how easy it was to use these! It was my first time trying decals and I had absolutely no problems (apart from cutting them a liiitle to small at the sides, but that's my own fault). They were easy to soak off the paper backing and really easy to place on the nails. If they are still wet you can even carefully remove them from the nail and place them again. Even though these were full nail images I had no problem smoothing them down and rubbing out the air bubbles and wrinkles by using a wet cotton pad. And the wear time on these is phenomenal! I am writing his on day 4 of this manicure and I don't even have visible tipwear yet! I know the basecolour and topcoat are in part responsible for this, but I feel like the decals may give your polish an extra layer of protection. And because you seal the decal in with topcoat, there is no chance for it to lift at the edges. Also the selection of patterns they have is great. They have both full nail and single images in a ton of styles and colours. You will certainly see more of these from me! So what do you guys think? Have you tried MILV decals yet and are you as impressed with them as I am? Or are you going to try them out? And how about this cute pattern? Please let me know what you think in the comments! Hypnotic Polish is a European based indie stockist that ships internationally. 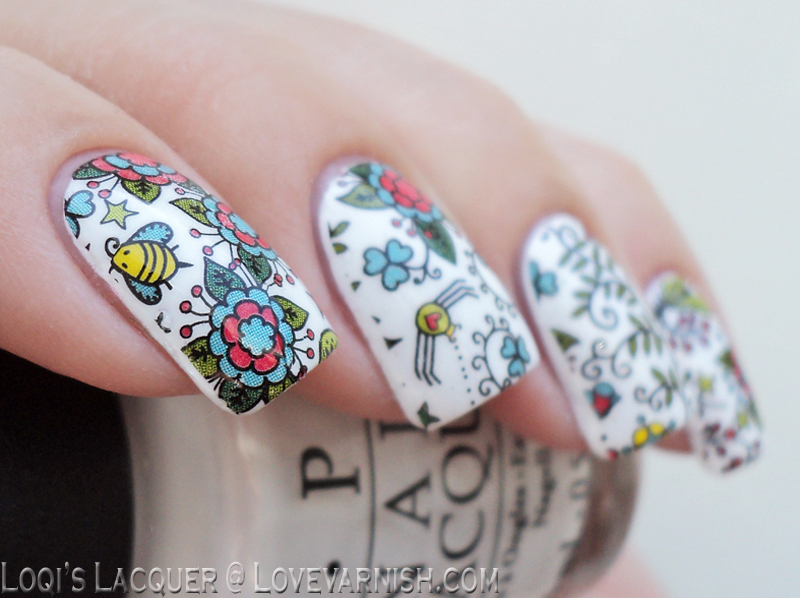 MILV Water Decals, they also carry Smitten Polish, El Corazon, Colors by Llarowe, Dance Legend and many others. MILV Water Decals sell for €1.50 a set. Love these! I'm going to have to check them out! This looks totally adorable! Love the design and how it pops against the white base :). These are so cute! So fun and the design really stands out on the white undie! Love! How cute is this design? I love full water decals. I can't wait to use my MILV decals! Their designs are so pretty! Wowza!! Super cool decals and design! Sometimes I enjoy using decals and sometime's I don't. I want them to be really special and eye-catching and these are right up my alley! Ohhhh wow these are so lovely! At first glance I thought they were leadlighting! These look so beautiful! I always have some troubles placing full water decals, but it seems like you did it perfectly! And what a good idea with a soaked cotton pad, gotta try this! Oh these are cute! Unfortunately I'm kind of a water decal hater. So fiddly for me. Shame because the designs can be so pretty, as witnessed here. 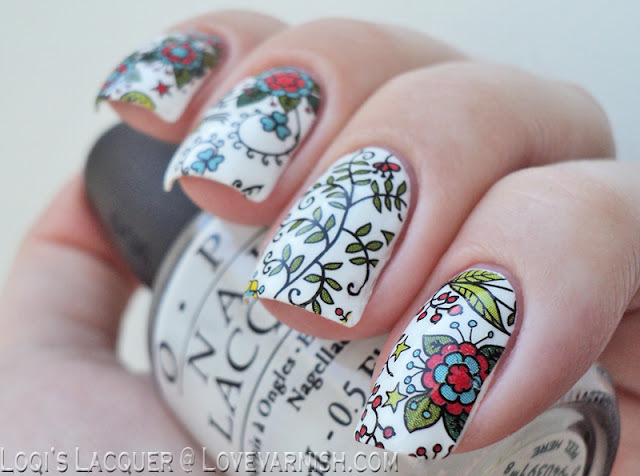 Beautiful design and mani! I have some small water decals, I was not a fan. Why do they always have to look so pretty?! 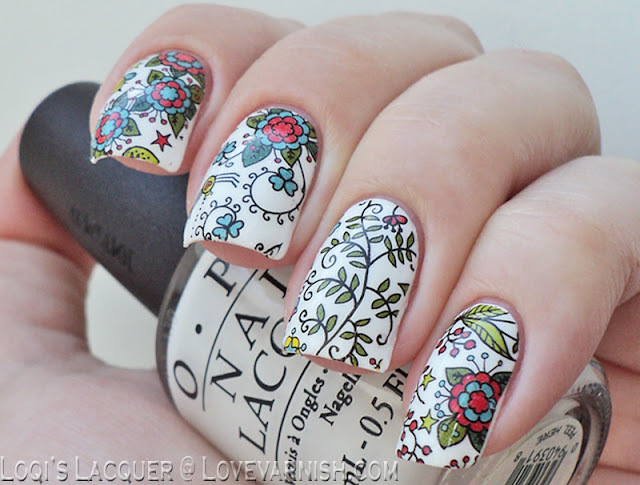 I love the design on these and I love water decals. They are my go to when I need something quick and fancy. I adore how bright and cheerful these are! I'm totally going to be putting some on my wish list! These are adorable!! I love the pattern!! At first I thought this was a stamped mani with the leadlight coloring it in (I think that's what it's called?) These are pretty! Wow, I'm surprised how cleanly and beautifully they look! I've never been very keen on water decals but I won't shun them anymore! Definitely impressed with these. I love the pattern and the crisp image on the decal. Plus it's also nice to see decals that work on longer nails! Glad you like them Kelly! It really worked wonderfully with a wet cotton pad to smooth them down. :D glad you like them! I wish I had the skill to do that haha! Russia is really impressing me with nail fashion lately! So am I. They turned out so well for a first time. That's true, exciting things are happening in our part of the world: first Russian indie brands, great stamping plates, a new exclusive line from Dance Legend - I feel like I don't have enough fingers to try all the new pretties haha. These decals are so pretty! I love how colourful they are. They are so pretty! Darn, every time I use full nail decals I just can't get them to lay straight on the sides, I always have wrinkles there. I thought it was because I have very curved nails but your are pretty curved, too! These are lovely, the images are so crisp! Some water decals can be so bubbly but there isn't a single bubble here, I'm impressed! Wow, these look absolutely gorgeous! I love the design so much! S T U N N I N G !!! I'm shopping as we speak, these are totally beautiful!